Jesus’ Actions. The treatment of Jesus consisted of a gesture and a pronouncement. The touch of Jesus was significant from two points of view. From the perspective of the leper it was an unheard-of act of compassion which must have moved him deeply and strengthened him in his conviction he had not asked for help in vain. From the perspective of Jesus’ relationship to the cultic and ritual system, it indicated that he did not hesitate to act in violation of its regulations when the situation demanded: “the ceremonial law gives place to the law of love when the two come into collision.” Jesus’ touch and his sovereign pronouncement mean the same thing: “I do will it. Be made clean.” This was not a priestly pronouncement, as is made clear in verses 43–44, but a declaration that healing would follow immediately and completely. The text describes an instantaneous radical healing which was visible to all who met the man. The difficulty confronting the interpreter in the reference to anger in v.41 recurs in v. 43. The language is very strong, and seems more appropriate in an address to a demon than to a man whom Jesus has just healed: “warning him sternly, he dismissed him at once..” While it is possible to give a milder translation of the terms used, the statement is intelligible as an expression of Jesus’ exasperation because he foresaw the disobedience of the man. It is explicitly stated in v.45 that Jesus was hindered from entering any further towns as a result of the man’s failure to heed Jesus’ injunction. As a consequence, the preaching mission within the synagogues of Galilee, reported in v.39, was interrupted. Jesus commanded the former leper to be silent concerning his healing, and instructed him to show himself to the priests, who alone could declare him clean, and to offer the sacrifices prescribed in the Mosaic Law. The procedure to be followed was set forth in Lev. 14:2–31, and involved different offerings depending on whether the man was poor or prosperous. In the first century the man had first to show himself to a priest in his place of residence, after which he must go to Jerusalem to be pronounced clean and to make the prescribed sacrifices. Jesus’ demand that the man comply with Mosaic regulation is qualified by the words “that will be proof for them.” This phrase may be interpreted differently depending on whether the testimony is considered to be positive or negative in character, and whether the people or the priests are in view. In keeping with the somber tone of the narrative it seems necessary to interpret the phrase in the negative sense demanded in the second instance where it occurs: “as a testimony against them.” Scholarly investigation has shown that the concept “testimony” or “witness” here, as in many passages, has the meaning of incriminating testimony which may serve as evidence for the prosecution. “Testimony” means a piece of proof which may be recalled and which can become an accusation. It is better to understand “them” as the priests, for it is they who must examine the man to determine whether the leprosy has been removed. Jesus’ statement then means that if the priests establish that healing has taken place and accept the sacrifice for cleansing but fail to recognize the person and power through whom healing has come, they will stand condemned by the very evidence which they have supplied. 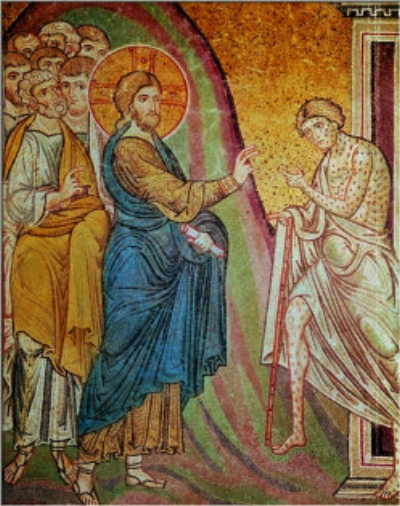 The healing of the leper demonstrated that God had done something new. If they neglect this sign or deliberately refer this gracious act to an evil origin, the accomplished sacrifice will testify against them on the day of judgment. It was, therefore, imperative that the man comply with Jesus’ instruction. It was necessary on his own behalf, but more important, he was to provide the evidence of the new thing God was doing, which if met with unbelief would serve as incriminating evidence against the priests. It is not known whether the man obeyed the injunction to show himself to a priest. He blatantly disregarded the injunction to silence, and assumed the posture of a missionary, declaring publicly over an extended area what he had experienced from Jesus. The result was that Jesus’ ministry in the synagogue was hampered, for he was no longer able to enter any town without encountering crowds of people waiting to throng one who could heal a leper, claiming benefactions for themselves. This was not the mission Jesus had come to fulfill. When he withdrew to places of solitude the people pursued him, but they understood neither Jesus nor the significance of his withdrawal to a place which recalled the wilderness in which his submission to the Father had been affirmed. Mark 1:43 warning him sternly. The Gr. verb embrimaomai lit. means “to snort” or “be indignant” (Mark 14:5; John 11:33, 38). Jesus sternly restricted the public announcement of what had taken place while urging the leper to follow the law by showing himself to the priest so he could be declared clean (1:44; Lev 14:1–20). Mark notes such calls to silence with respect to demons (1:34; 3:12), those healed (1:43–44; 5:43; 7:36), and the disciples (8:30; 9:9). Mark 1:44 that will be proof for them. This was a recognition of God’s gracious work of healing through Jesus. The Greek also allows for the interpretation, “a testimony against them.” In other spots where this expression appears, it is negative, meaning “against them” (6:11; 13:9). The meaning appears to be that the evidence of God’s acting through Jesus (when the healed man offered a sacrifice) would stand as a testimony against the priests when they came to reject the reality that God was working through Jesus. This entry was posted in Scripture and tagged be made clearn, leper, Mark 1:40-45 by Friar Musings. Bookmark the permalink.